A Porthleven-based 3D design company recently won a commission with a Bristol hospital. 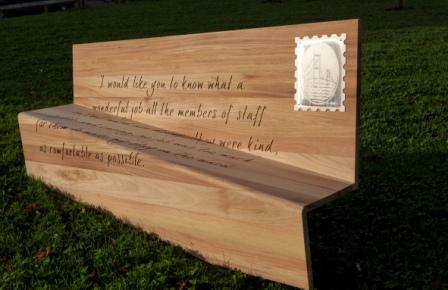 After working closely with staff and patients, the concept of the bench was decided on: a folded postcard from an actual letter sent by a patient who stayed at the hospital. The message reassures new patients about the experience they will have during their stay. Made from hardwood, the letters are carefully hand carved to create a personal tone. The seat is supported on a stainless steel frame.